The C43 was one of AMG’s first mid-level models when the current-generation C-class went on sale back in 2013. 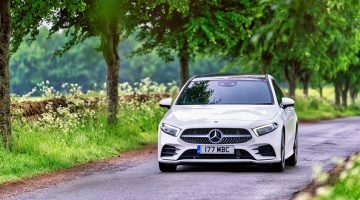 Comprising a twin-turbocharged V6 engine, 4Matic all-wheel drive and a standard nine-speed auto, we liked the C43’s subtlety, but wondered whether it was enough to warrant the AMG badge. It was, after all, initially to be called the C450 AMG Sport, and not a C43. Despite our reservations, after tenure with an estate on the Fast Fleet, we grew to love its deceptively subtle design and ability to entertain more than an Audi S4, a model it was almost directly engineered to compete with. As of the 2018 model year, Mercedes gave the C-class an update, which followed through to the C43 Coupe we’re driving here. So, have the C43’s performance coupe aspirations improved? Slip into the familiar C-class cabin and you’ll immediately spot the components changed during the refresh. 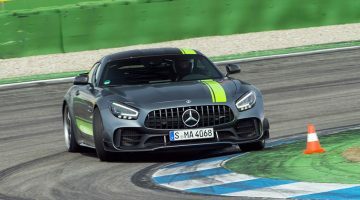 The new AMG steering wheel looks complex, technical and aggressive, but feels great, with that usual firm rim that places your hands perfectly on the three and nine-o’clock positions. Behind sits a new digital dial pack, squeezed into the cowelled cluster that went before. The chintzy, plasticky look of the previous C-class is lessened, even if it still lacks the Poggenpohl-cool of an Audi S5. It’s not perfect though – the seats are a little hard and unsupportive and the interior plastics are not up to Audi’s high standards. The C-class’s central dash is finished in gloss black plastic as standard, which is surely ready to be dropped as it’s prone to scratching, but the open-pore wood option is at least reasonably well priced. The C43 has kept its twin-turbocharged 3-litre V6, despite the proliferation of Merc’s new in-line six unit elsewhere in the range. It now produces 385bhp, with a thick slog of torque in the mid-range. Lag is kept at bay, even with shorter, sharper throttle movements, only tapering right at the extremity of the rev range. The Coupe will reach 100kph in 4.7sec, and go on to a 250kph top speed. Go too far and the aggressive rev-limiter can catch you out, but the new digital dial’s quite spectacular change-up lights are on hand to let you know when to pull a paddle after you make that mistake once. 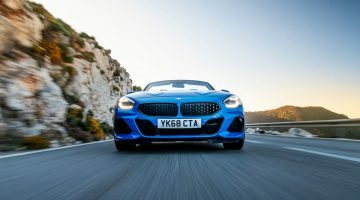 The transmission still lacks the ultimate fast-paced crispness of a dual clutch, but makes up for it with smoother low-speed operation than you might expect. Press the engine start button and it quickly flares into life, before settling itself into a neat, quiet idle. But where you might have aimlessly sought an AMG’s best button before, the updated C43 doesn’t disappoint, by finally offering a more vocal active exhaust. Button firmly pressed, the C43’s raspy V6 engine note begins to dominate the cabin – which, let’s be honest, is the whole point of an AMG. The new nine-speed torque converter automatic (not the MCT wet clutch automatic seen in V8-powered AMGs) pulls the car away cleanly, even if the unit does have a propensity to hold on to first gear for a tad too long. It’s now that the V6 starts to feel more aggressive, more vocal than the previous C43, better justifying that AMG badge on the bootlid. Response is impressive, spooling quickly and decisively, all the time emitting a raucous bark from the new round exhausts. It’s an infinitely more emotional experience than an Audi S5. The chassis plays the same game, losing some of the standard C-class’s suppleness in the ride and steering, but translating information from the road surface so much more vividly. It feels compact, agile and enthusiastic, a claim I’m not sure you could make of an S5. There is a definite edge to the ride, only exaggerated by our test car’s optional 19-inch wheels (18s are standard) and dynamic setting on the adjustable suspension, but it’s never jarring. The all-wheel-drive system is pleasingly transparent, allowing the rear wheels to do most of the propulsion and only moving power to the front axle on aggressive throttle movements to maintain traction. A bit more space, or a racetrack, would allow us to fully understand the chassis’ outer limits, but on smaller roads the C43 is immensely capable, yet not at the expense of interaction. The brakes are typically strong and reassuring, with a firm bite at the top of the pedal. Pricing kicks off at $63,965, with plenty of standard equipment including 18-inch wheels, LED headlights, leather sports seats and the facelifted C-class’s revised infotainment system. Two main equipment packages are then offered – the Premium package ($3551) adds in a digital instrument cluster, online infotainment system, heated seats and an upgraded sound system. Plump for the Premium Plus package ($6347) and you’ll also get a sliding panoramic roof, Burmester sound system, adaptive LED headlights, 360-degree parking and keyless entry and go. The Audi S5 starts at $61,011 and has more standard equipment, but you’ll still need to click a few option boxes to get the high-end sound system and Audi’s slick Virtual Cockpit. Although BMW does not have a direct rival, $63,292 will get you into the smaller, but far more serious M2 Competition, something we’d have to think long and hard about overlooking, despite its daintier dimensions.